As Associate Provost and Dean of Research for John Jay College of Criminal Justice, Anthony Carpi, Ph.D. knew the College’s status as a Minority Serving and Hispanic Serving Institution made him well suited to serve on a special committee for the National Academies of Sciences, Engineering and Medicine. 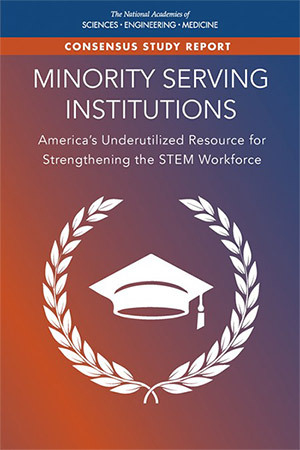 The committee produced the report, “Minority Serving Institutions: America’s Underutilized Resource for Strengthening the STEM Workforce,” which was released last month. It offers best practices and success strategies that could bring more underrepresented students into the STEM workforce. The goal to find ways that Minority-Serving Institutions (MSIs) can encourage students of color to pursue degrees in science, technology, engineering, and math. The U.S. Department of Education designates a college as an MSI based on measurements like the number of minority students enrolled. The report cites PRISM, The Program for Research Initiatives in Science and Math, as a model program for other colleges to emulate. Carpi founded PRISM in 2006 and has been instrumental in helping almost 100 students gain admissions to top post-graduate STEM and health programs at institutions such as Princeton University, University of Pennsylvania, and Weill Cornell Graduate School of Medical Sciences. Students in the PRISM Undergraduate Research Program work closely with a faculty mentor on a range of research in fields, including: Molecular Biology, Forensic Entomology, Cancer Biology, Organic Chemistry, and Computer Programming. They receive stipends to help them focus on research, saving many from needing to find a job outside the College. PRISM serves about 45 students each year. For the ones that go on to post-graduate work, about half are part of underrepresented populations in science and math fields. The MSI report recommends that programs like PRISM become a top educational priority and receive greater attention and funding from public and private sources like the Department of Education, Department of Defense and the National Science Foundation.